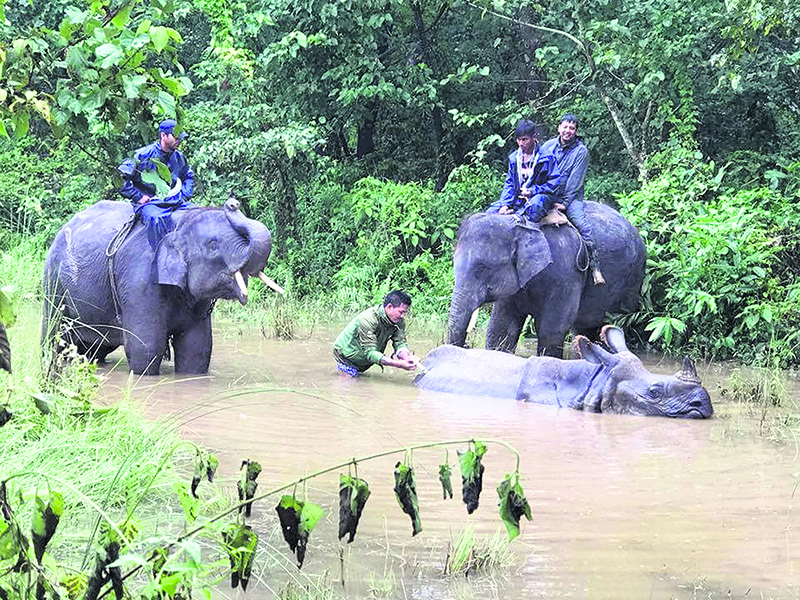 CHITWAN, August 18: Monsoon floods not only cause trouble to human settlements time and again, they are also a threat to the endangered rhinos of Chitwan National Park (CNP). During the monsoon, floodwater has caused severe injuries to the one-horned rhinos and even killed them . The monsoon flood this time has washed away a few of the rhinos of CNP to India across the border. In one instance, a Chitwan rhino that was washed away has landed in Bagaha, India. Officials from CNP are working to bring the rhino back. Nurendra Aryal, assistant conservation officer at CNP, has been in Bagaha since Tuesday for the purpose. The rhino was washed down by the massive flooding in the Rapti and Narayani rivers last Friday. “The Chitwan rhino was washed 42 kilometers down to Bagaha. I have been working to bring it back,” said Aryal over the phone. “We are preparing to tranquilize it and transport it back to Chitwan by truck. However, we are being delayed by the poor condition of the Dauenney highway,” he added. Another rhino washed down by the flood has been roaming around the forest areas of the Balmiki Ashram in Nepal and India's Balmiki Tiger Reserve at Balmiki Nagar Bhaisalot, according to Aryal. The guards at the reserve have been looking after the security to the rhino while CNP goes about gathering more information. The rhino could not be brought back so far as it is in a waterlogged area, it is stated. Another rhino from Nepal has also been observed in the forests of Balmi Nagar. Apart from these three animals, two other rhinos from CNP have ended up at Keuleni and Narsahi within Nepal. “In the case of the rhino at Bagaha, it is not possible to tranquilize it and transport it back. As an alternative, we are planning to chase it through the jungles all the way back to CNP ,” Aryal said. “We are assessing the situation. We are also treating the injured rhinos and safeguarding their horns,” added Aryal, who is also the spokesperson for CNP. One rhino was recently found injured in the Incharni area of Sauraha. CPN informed that a medial team has been dispatched to the area to provide treatment to the striken rhino. CNP is the main rhino habitat in Nepal. Out of the rhino population of 645 in the country, 605 are at CNP.